A busy weekend coming up at St Clement’s. High Mass three days running! On Saturday at 11, Fr Sipe will sing the Mass of the Presentation of Our Lady to commemorate the 20th Anniversary of his priesthood, and in thanksgiving for his recent promotion to Full Professor at the University of Pennsylvania. This will be followed by a lunch for sixty or seventy people: friends, colleagues and parishioners. Already the smell of baking hams is drifting from the church kitchen. Then on Sunday, the last Sunday after Pentecost, I will sing the High Mass, and our Guest Preacher will be Brother Steven Haws, a member of the Community of the Resurrection from Mirfield, Yorkshire, in the north of England. Brother Steven is an old St Clement’s member, and it is always good to welcome him back. To crown it all, Monday is the Feast of our Patron Saint Clement, and our Guest Preacher that day will be Fr Fred Robinson, Rector of the Church of the Redeemer, Sarasota, Florida. Fr Robinson will be the last of our special preachers in this 150th Anniversary Year of the opening of St Clement’s. It has been a great year, and the many special preachers have given it a special flavour. Next year we will be back to normal (if St Clement’s can ever be called normal! ), though I plan to vary the preaching diet with some of the local clergy. Alright Father, I concede that it is not a mortal sin to inhale the smell of baking hams on a Friday since not even incense will cover that mouth watering aroma. However, to make reference to such a smell on a blog where countless readers will be cast into throes of envy is really quite unforgiveable. 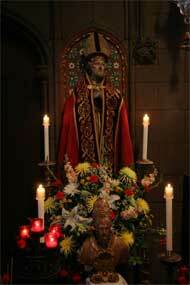 I attended High Mass there on the feast of St. Clement about ten years ago (how time flies!) The music of the Mass was Mozart’s Coronation Mass and the preacher was Father David Houlding SSC. That nasty Bishop Bennison was spotted in the congregation. How we laughed at the fact that the silent Canon meant that he wouldn’t have heard his own name ommitted while that of the Holy Father was included. Happy St. Clement’s Day to all of you and don’t forget that after the High Mass on Sunday there is veneration of the relic of St. Cecilia. A very blessed feast and octave to you all. This blog is a delight to read (or even Reid!) and an encouragement in these times.